During May and June of 2013, all users of GpsPrune were invited to take part in a user survey, where they could answer questions about how they use GpsPrune and which parts of it are most important to them. Users were told about this survey either when they visited the GpsPrune website, or if they have subscribed to the ActivityWorkshop rss feed, or when they used GpsPrune to check for a new version of the software. In this way, there is an obvious selection bias as only those users interested enough to take part, took part. But of course they are exactly the users whose opinions count the most, so let's see what the results are. Firstly we'd like to have an idea of who uses GpsPrune, in particular which country are they from and which language do they use GpsPrune in. We've already seen that many user requests come from Europe, but of course the website and the survey are only in English so maybe that would skew the answers to English-speaking countries? The country information was taken from the IP addresses, and shows a clear majority of users in Europe (over three-quarters of the respondents). 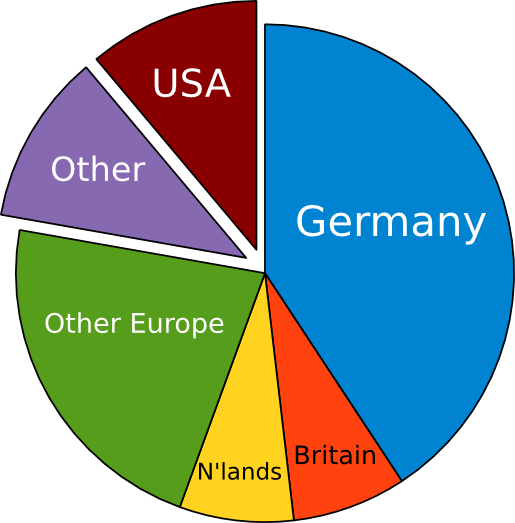 Plus, around 40% of the respondents are from Germany, which is a big surprise. I knew that the German OpenStreetMap community is extremely active, but I didn't really appreciate how many of the GpsPrune users are based there too. 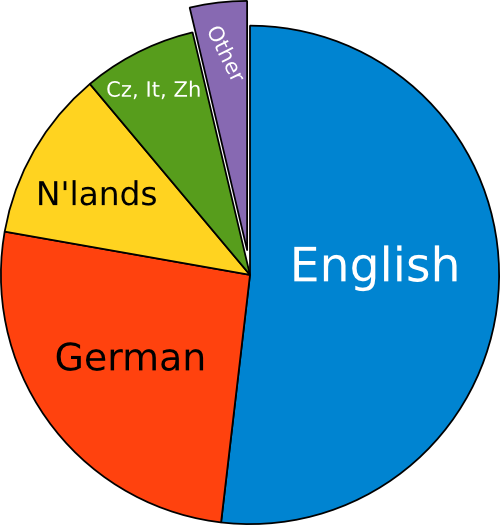 Interestingly, it seems not all of those users in Germany use GpsPrune in German, as the second pie chart illustrates that the dominant language is still English. Maybe those people in Germany are not native German speakers, or maybe they're just used to their computer software running in English. Predictably, English, German and Dutch make up almost all the language base. Even though GpsPrune supports many other languages, this survey suggests that the top three languages keep almost everybody happy. I thought it would be interesting to see what kind of systems people have and the other programs which they use together with GpsPrune. In particular, as GpsPrune is a multi-platform application, are GpsPrune users also users of Linux, Windows, Mac OSX, or a mixture? 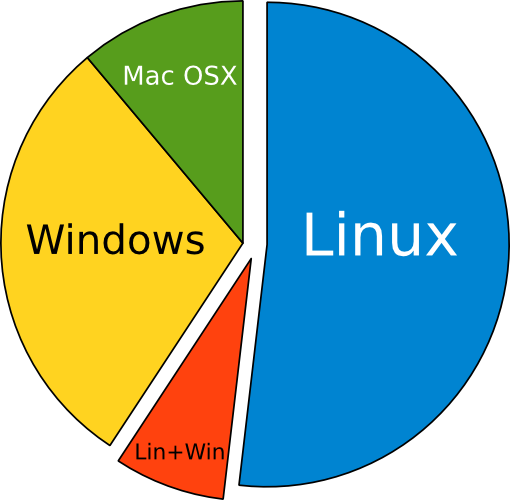 I expected Windows to dominate, but surprisingly over half the respondents use just Linux, and another bunch use a mixture of Linux and Windows. About another third use Windows alone, with Mac OSX being a significant minority. All in all, quite a broad mix, so it's great that GpsPrune can support all three platforms. Almost all users use just one system though, apart from the small number of Linux/Windows mixers. The second chart shows which other programs people use alongside GpsPrune. Fairly predictably, GPSBabel is a firm favourite, and is presumably used to communicate with a GPS receiver (loading or sending data) or perhaps for importing special files. Next is Google Earth, an obvious (although not open-source) choice for visualizing the tracks from GpsPrune. Then Exiftool, used for writing GPS coordinates into photograph files. 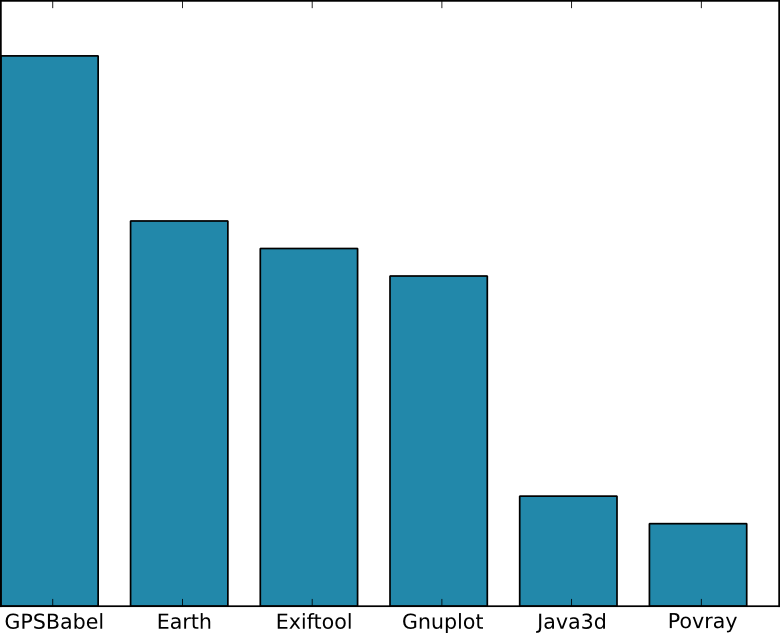 What surprised me was the distinctly lower popularity of the 3D tools Java3D and Povray. Personally I find them invaluable for showing the 3D nature of tracks, but it seems most users either stick with Google Earth for that, or are maybe just happy with 2D representations. One question I didn't ask in the survey is which version of java people use. I considered it but I thought it rather too technical. Many people probably don't know. It's become a bit of a minefield recently with versions 5, 6 and 7 all existing in parallel, with JREs from Sun, Oracle and OpenJDK (and others). Apple users were restricted to version 5 of java, but I'm not sure if this is still the case. In any case, it is planned for GpsPrune to continue compatibility with all these three versions. I did ask which version of GpsPrune people are using, and the answer was overwhelmingly the current version 15. Only a small number of people were using versions 13 or 14, and almost all of them were getting those from their linux package manager. Only one person got their copy of GpsPrune from another source, not from this website and not from a package manager. What do people use GpsPrune for? Firstly we look at what overall purpose people use GpsPrune for. In this case the first chart shows us that the most popular use is to analyse recorded data after a trip. So that probably means examining distances, climbs, speeds and so on, and perhaps comparison with maps or with other tracks. Next comes editing and conversion, so that is again working with recorded data but more geared towards preparation for publishing, conversion to other formats and splitting and joining of files. Less popular is the planning of trips in advance, even though GpsPrune's functions to support this have been greatly improved over the last few versions. And finally, "mapping with OSM" is only done by a minority of users, perhaps fewer than I would have expected. It's also good to see that over 80% of the respondents use GpsPrune for more than one of these purposes, emphasising that GpsPrune has evolved into a multi-purpose tool with various ways of using it. 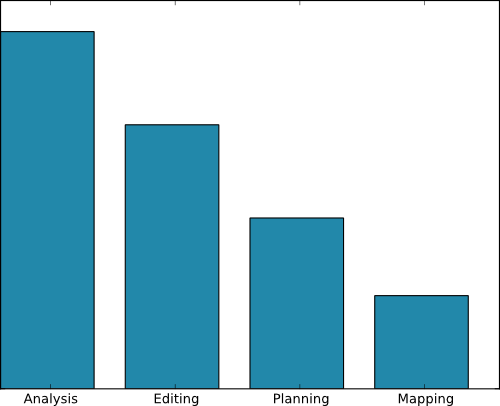 The second chart here shows which of GpsPrune's functions people actually use. I had a suspicion that the function "download map data from OSM" and "export SVG" weren't actually being used any more, in which case they could possibly be removed in future GpsPrune versions. Not too surprisingly, using photos is popular, and I presume that includes correlation and saving of exif data. Compression is also used by many, as is altitude lookup from SRTM. Dragging points by hand is surprisingly popular, given that users said they didn't use GpsPrune to plan trips. I wonder if they're "correcting" their GPS data in this way? Perhaps this needs to be discussed in greater detail in the user guide. On the other hand, interacting with a GPS is quite low on the list, I would have expected it to be higher, as it's fundamental to GpsPrune's original aim. Unless people are using other tools to extract their data from their GPS receiver perhaps, and hence answered "no" to this even though they're using GPS data. Lower down on the popularity scale are generating charts with gnuplot, downloading and uploading to gpsies.com, and downloading map data from OSM. This surprises me too, I thought that practically noone uses this any more. Now I wonder whether my question was misinterpreted and some people thought the question was referring to the map tiles. Alas that means I can't just remove this feature as I thought. 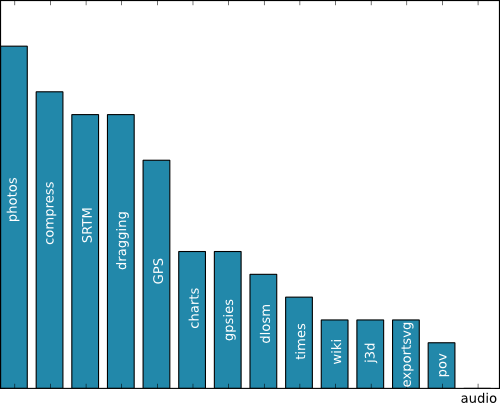 Then there's the time estimation functions, relatively high given their recent addition, and the wikipedia functions which I use a lot but apparently aren't that popular. Or are they too well-hidden? Then java3d, which as we've already seen isn't used as much as I thought, but the export to svg function (which I thought noone used) actually did get some votes. Then povray, as we've already seen, and then finally the audio files, which indeed NOONE said they used. Could this be a candidate to remove in a future release? It was mainly introduced for the OSM mappers, but subsequently JOSM introduced something kind of similar, and maybe they all use that now instead. Removing it would save a top-level menu, but wouldn't actually gain much else because the features don't take up space if you don't load audio files. Have people bought the user guide? Less than 10% of the respondents said they had bought a user guide. Which is actually good, because it means there are plenty of enthusiastic GpsPrune users who haven't bought one yet. Of those who have bought one, the "usefulness" was given as either "excellent" or "good", with nobody saying it was "adequate" or "poor". So I'm happy that the purchasers seem satisfied with the quality and usefulness of the guide. Of course, these are the users who are still using GpsPrune and responding to surveys, but still. In terms of value for money, again the responses were split between "Good value" and "Ok value", with nobody answering "Too expensive". So again that's reassuring that people don't think they paid too much for what they got. But the number of respondents here is too low for the numbers to mean much. The following are a selection of the comments received - these came in as a mix of usage notes, suggestions and just general feedback. I use GpsPrune mainly to get rid of superfluous points in my recorded tracks: keeps my iPhone app (MotionX GPS) snappy. Thanks for this great tool! I use GpsPrune mostly for editing and repairing tracks which get distorted by GPS problems, wandering around on a trail, etc. Thanks for writing and documenting this useful program. Didn't know some of the functions but will give them a try next. That's a good point, maybe some people just don't know all the functions which are available. Would more YouTube demo videos help raise awareness of what else GpsPrune can do? For analysis or planning a trip often I open more than one track at the same time. In this case sometimes I lost the overview because all tracks has the same colour. I believe the possibility to change the colour of tracks or track segments would be a great help for this issue. Very good suggestion. This has been on the wishlist for some time. I definitely don't want to turn GpsPrune into a super-powerful GIS suite, which can do everything but is impossible to use. You're right though, it would be good to have more colouring options, perhaps according to file, or segment, or distance, or time. Great software, mate. It would be even better with keyboard shortcuts and more context menu (on right click). I guess you mean more keyboard shortcuts, hopefully you've seen the existing ones already (Help -> Show shortcut keys) and the shortcuts in the menus. As for the context menu, I guess you mean the one on the main map. Do you mean launching functions from here, like delete range or reverse range, things like that? It definitely shouldn't grow too big though! I record my tours by feet, bicycle, motorcar with my iPhone and the App myTracks. Then I transfer the GPS-files to my MacBook Pro and open the files in GpsPrune. Editing then works perfectly, followed by exporting to a gpx-file which can by opened in Google Earth, JOSM, Merkaartor. Interesting, I've never tried logging with a mobile phone, but in principle it should work the same as using a regular GPS receiver or a data logger. Nice to see so many platforms and programs working together. Outstanding software and user guide. Thank you! Some great suggestions there, and it's great to hear feedback from people who are using and liking GpsPrune. If you can expand on any of the suggestions here, I would encourage you to get in touch either by email or on the sourceforge forums, so that we can clarify the ideas. This was a very interesting exercise, and even though the number of responses was fairly low, it still came out with some valuable results I think. It's good to get a better idea of what people use GpsPrune for, and I will certainly go over these answers carefully when looking at what features to add or improve next. I'm surprised by some of the answers, in particular the export to SVG and download from OSM. And the comment fields provided some good suggestions which will come in useful. I'd like to run another similar survey at some later date, to see if the usage has changed and see where to direct the development. Thank you very much to all those who contributed to the survey! Page last updated June 2013. Feedback welcome at mail@activityworkshop.net.